It’s true: Breakfast really is the most important meal of the day. So as you plan your event, consider catering a great first meal of the day for your group. Our breakfasts — always refreshing and delicious — will start your event off on the right foot! Our variety of offerings will carry your group through the morning and leave them with a positive, lasting impression! Featuring a catered breakfast at your event allows you to warmly welcome your guests with an array of satisfying options. If the type of event you’re planning calls for a full spread, we’ve got you covered. 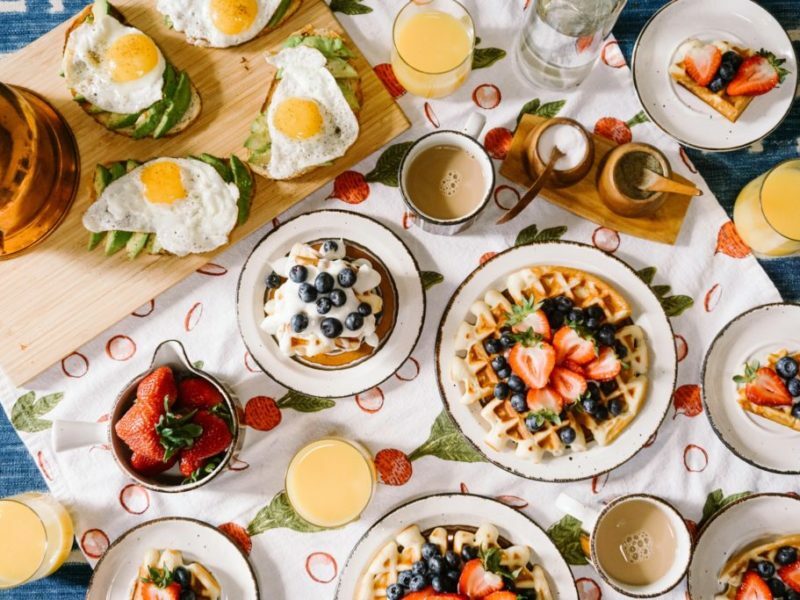 For instance, if you’re planning a day-long retreat as a getaway or reward for your employees, then by all means show them your appreciation with a morning meal that they probably never have time for during their busy week! Think French toast, pancakes, or (yes!) waffles, with butter and topped with a fruit compote or real maple syrup — or both! Include slices of Canadian bacon, ham, crisp bacon or sausages to satisfy the hungriest of tummies. And of course, we serve all kinds of eggs — from benedicts and scrambles to simple hard-boiled goodies — and don’t forget about our lightly seasoned home fried potatoes that are simultaneously crisp and soft. Lighter breakfasts go well with “thinking” events during which your group will need to brainstorm, engage others, or even make presentations. Fresh bagels with various cream cheese spreads, assorted pastries, delicious fruits, yogurt, and hard-boiled eggs work well for this type of event. Just be sure to include items that your group can easily munch on all morning, like mini muffins, fresh fruit, granola, trail mix, or energy bars. You may feel it’s wise to cater breakfast offerings for both the light and hearty appetites. Perhaps your goal is to offer a few basic items that will bring smiles while conveying to your guest that they are special. We can prepare a single main attraction, such as breakfast quiche or sausage biscuits, surrounded by lighter offerings like fresh fruit and pastries. Let Us Cater Your Beautiful, Bountiful Breakfast! Douglas K. Catering will gladly assist as you consider what menu items to feature when you greet your morning guests! Whether light and refreshing or hearty and filling, our breakfast selections include the savory, sweet, and succulent. Let us help make your morning event a very special and memorable one! We provide the best in top quality food and personal service for all of our customers. We want to make it easy and delicious for you with our home & office delivery service to complete special event planning & catering. Douglas K Katering, Serving Dade, Broward, and Palm Beach Counties.